The Mississippi Blues Trail identifies influential musicians as well as historic sites and places that contributed to our wonderful blues heritage. The county’s most prominent blues singer was Big Joe Williams of Crawford, who toured several continents before bringing his legendary talent to Catfish Alley. In the late ’50s, Big Joe began a career as a “folk blues” artist. He performed widely at coffeehouses and festivals and recorded many albums for Delmark, Arhoolie, Testament, and Bluesville. He was particularly popular in Chicago, where he lived in the basement of the Jazz Record Mart, and his legendary travels and cantankerous personality were captured in guitarist Mike Bloomfield’s memoir, Me and Big Joe. Williams died in Macon on December 17, 1982, and is buried about six miles west of town in Oktibbeha County. He was inducted into the Blues Hall of Fame in 1992. “Catfish Alley” deserves this Blues Trail marker for its legendary reputation as the epicenter of blues, jazz, and soul music in North Mississippi. 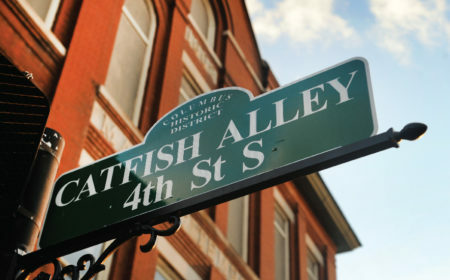 Located in the region that produced famed musicians like Howlin’ Wolf and Big Joe Williams, Catfish Alley successfully attracted national music acts including B.B. King, Duke Ellington, Little Richard, Bobby Bland, Louis Armstrong, and James Brown. Among other early blues guitarists based in Columbus were Otto Virgial, Robert Blewett, Tom Turner, and Bukka White. These notable blues musicians have all contributed to the rich history that has earned Columbus a highlighted position on the Mississippi Blues Trail. 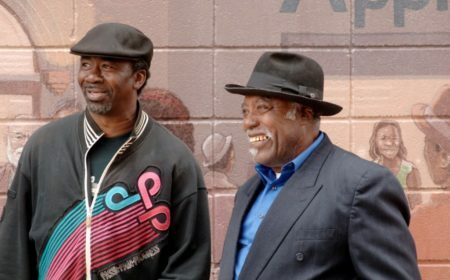 “Catfish Alley” is a long-time center of African-American business and social life. Some say the name originated after local fishermen brought their catches from the Tombigbee River to be sold and cooked on the street, with the aroma of catfish permeating the air. One of the giants of post-World War II Chicago blues, Chester Arthur Burnett, aka “Howlin’ Wolf,” was born in White Station, just north of West Point, on June 10, 1910. In his early teens, Burnett began performing in the Delta and was later a pioneer in electrifying the Delta blues. After moving north, Burnett nonetheless remained a strong presence on the Mississippi blues scene. 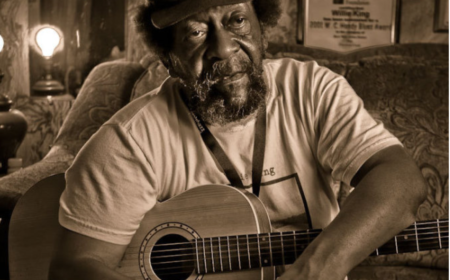 He frequently returned to this area to visit friends, hunt and fish, and perform at local venues such as Ferdinand Sykes’s place on Cottrell Street in West Point, Roxy’s juke joint in White Station, and the Chicken Shack in Union Star. He died on January 10, 1976, in Hines, Illinois. West Point established a festival in his honor in 1996 and a museum in 2005. For several decades beginning in the early 1900s, the area that includes the site of the Queen City Hotel was part of a vibrant African-American community along Seventh Avenue North. The hotel, founded by a former slave, catered to African Americans throughout the segregation era, and once housed visiting celebrities such as Ella Fitzgerald, B.B. King, Duke Ellington, and James Brown, along with many famous athletes of the day.